Put time into dinner now, and you can make it last forever -- or at least the whole week. Welcome to Halfway to Dinner, where we show you how to stretch your staples every which way. Today: fiveandspice -- you may remember her from this -- challenges yogurt to a six-dinner duel and gives us a recipe for Yogurt Soup, below. My husband has a habit of populating our refrigerator with cultured dairy products -- mostly sour cream -- just so I have to work them into our meals. Unsurprisingly, it was his suggestion that I stretch dairy into a week of dinners. I think he was envisioning evenings filled with nachos and stroganoff. Instead of sour cream, I turned to our giant container of yogurt, always there, always waiting to helpfully pull a meal together. If yogurt is a staple in your house, you might keep it for granola and smoothies -- but it is capable of so much more. Or even better: if you, like one of our Turkish friends, happen to make your own yogurt in gallon-sized quantities each week, then your stash is capable of underpinning an entire cuisine. I figured mine could certainly do the same. Inspired by the copy of Jerusalem that I received for Christmas, our first yogurt-y meal was a winterized version of Na'ama's fattoush. Mix together roasted winter vegetables with large handfuls of fresh parsley and mint. 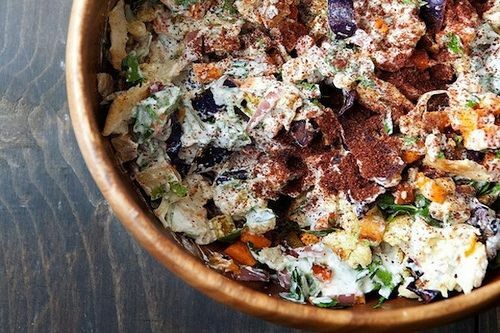 Toss this with shards of toasted Turkish flatbread, a dressing of yogurt, garlic, and lemon juice, and a liberal sprinkling of sumac for a winter salad that won't leave you chilled. My attempt to make paneer from yogurt was a fail (though in truth, making labneh instead can hardly be considered a failure). 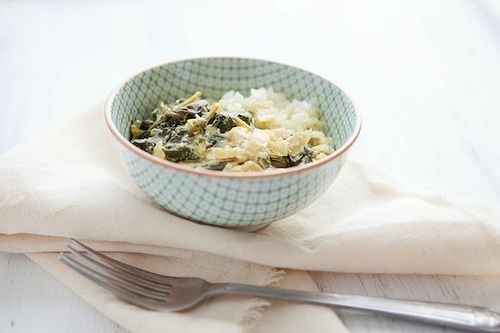 But, using a cup and a half of thick yogurt plus a splash of vegetable stock in place of the buttermilk and cream in Merrill's Saag Paneer makes for such a splendidly filling supper over rice and roasted cauliflower, we didn't miss the cubes of cheese one bit. The next evening I began to muse about whether drained yogurt could be subbed in for ricotta to make gnudi. The answer: yes. Stir together two cups of Greek-style yogurt with an egg, a quarter cup of grated Parmesan, and one cup of flour. Coat a work surface generously with semolina and mound 2-tablespoon-sized heaps of the yogurt dough (it will be very delicate and wet) onto it. Sprinkle the tops of the dumplings with more semolina. Bring a pot of salted water to a boil and then gently lower the dumplings in with a slotted spoon or spatula. Boil until they bob to the surface, then continue to cook them for two minutes more before removing them from the water with the slotted spoon. To top it off, a rich mushroom sauce like Deb's bourguignon (my version was minus the pearl onions but plus some bacon ends leftover from brunch). Back to Turkey now -- these people really know their way around yogurt. You can make a simple warm yogurt soup (very traditional, I'm told) by cooking together onion, garlic, and a big handful of rice until golden, then stirring in several cups of water to simmer until the rice is tender. Finally the yogurt, a good two cups, goes in along with salt and pepper. 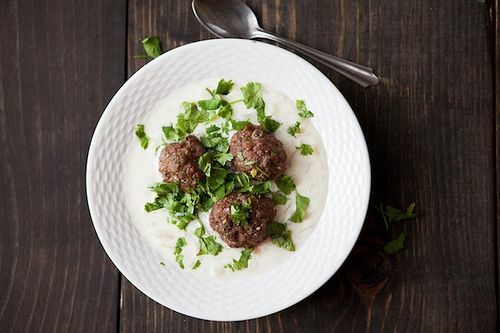 Ladle the soup around little baked meatballs made of ground lamb mixed with plenty of garlic and herbs, then top the bowls off with even more chopped herbs (more parsley and mint or perhaps cilantro, if you have it). A friend of ours is a salmon-fisherman in the summer (and a maple-syruper in the winter -- a very good friend to have), so salmon is another staple in our kitchen. Instead of a more typical tandoori-style yogurt marinade, I decide to flavor mine with mustard. Stir together a half-cup of yogurt with a couple spoons of grainy mustard, a smashed clove of garlic, and a little drizzle of maple syrup. If you wish, you can add a spoonful of horseradish as well. Salt your salmon fillet, spread the yogurt marinade all over it, and set it aside to marinate at room temperature for half an hour. 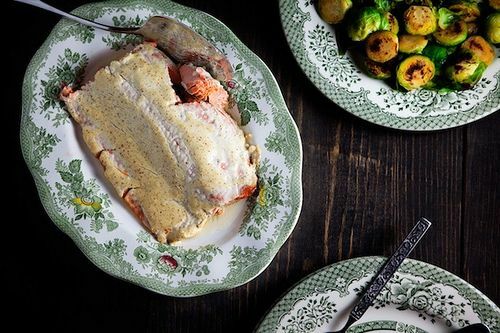 Roast your salmon until it flakes easily with a fork, and serve it with lots of vegetables. A bonus breakfast because I had just a few spoonfuls of yogurt left. This is, in fact, a staple breakfast in our house because of its ability to use up vegetables, and because I love the texture yogurt takes on when baked. Use last night's roasted vegetables (my favorites are sweet potato or parsnip cubes, cooked greens, or roasted Brussels sprouts) and put them in a small baking dish. If I have some nice lunch ham around, I usually steal a slice or two and add it, thinly sliced, as well. Crack an egg per person over the vegetables, dollop spoonfuls of yogurt (preferably the thick kind) all around, and sprinkle with salt and pepper. 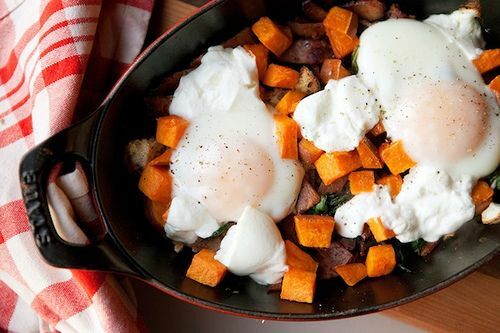 Bake until the egg whites are set but the yolks are runny, a mere 10-12 minutes in a hot oven. Serve with yogurt biscuits if you really want to go wild. Of course, this can also double as dinner. You needn't have even asked. The yogurt soup with lamb meatballs is right up my alley! It's been so chilly in Seattle lately, all I want is warming soul Mediterranean soul food. Thanks for these fab recipes! It would be good for a chilly Seattle winter evening, for sure! Thank you so much for wonderful advices. I used to make yougurt by myself now and will try to prepare salmon just immideately! these look wonderful. Do you start wwith greek or plain yogurt? DO you have Scandinavian blog, too? I use a strained Greek-style yogurt. I don't have a blog that is specifically Scandinavian. I blog about all sorts of food, but that does include a variety of Scandinavian - especially Norwegian - foods, from time to time. What wonderful ideas! 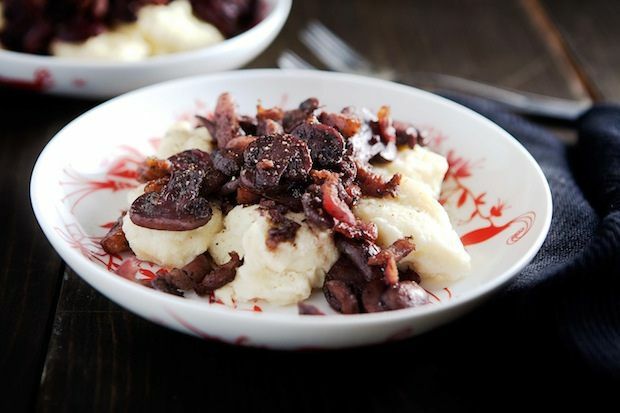 I love the inspiration for yogurt dumplings since I always have yogurt around but not always ricotta. Thanks FM! I was glad I tried it. They were like gnudi or dumplings with a pleasant tang. so many great recipes and ideas in this post. i buy plain yogurt by the tub and often wonder how it could work into savory meals. Yay! Glad you found some of the ideas helpful. Wonderful ideas! I am going to try your version of the saag paneer immediately! Thanks! I hope you like it as much as we did. This is genius, Emily. I owe you. I feel the same way each time I read your column!